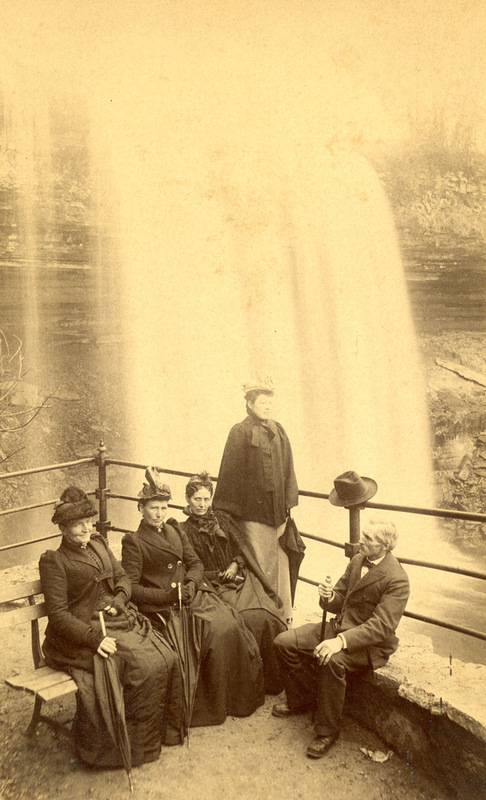 These solid citizens commemorated their visit to Minnehaha Park with a photograph. This undated photo from some time in the 1890s shows a place to sit built into the edge of the park board platform. That seating seems not to have lasted into the 20th century (see images in older posts, below). Stone construction is hard, heavy work. Probably this was rebuilt because of the basic instability of the site. Vandalism? Disrepair? Deterioration? 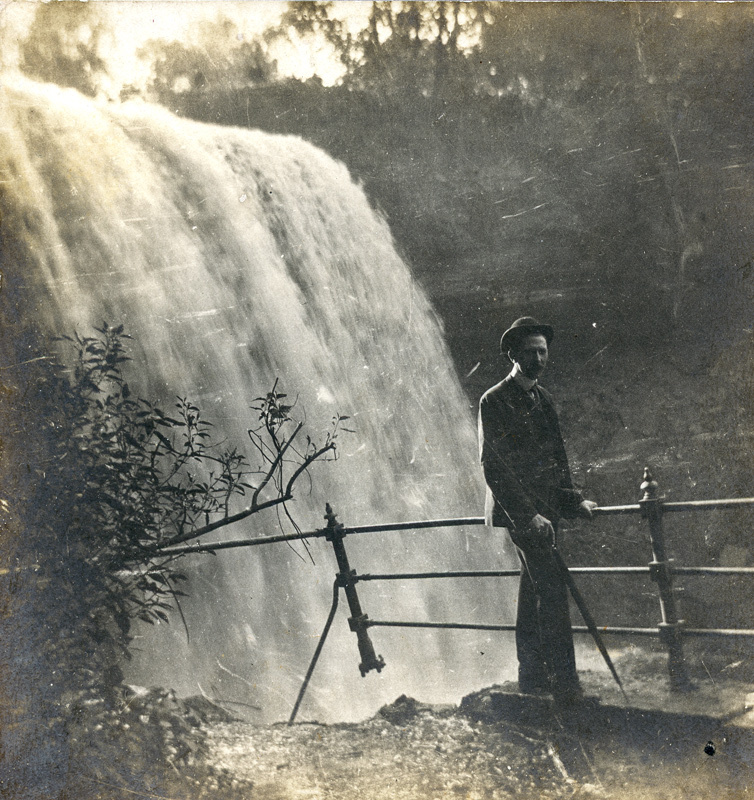 Someone named Will Taylor poses before Minnehaha Falls. 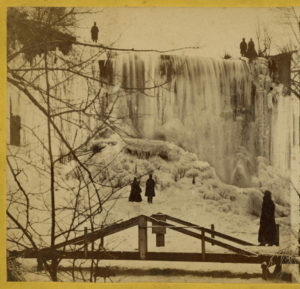 Winter visitors to Minnehaha in the early 1860s, taken by Benjamin Franklin Upton. One of the little details that is so great about this picture is the entrance to the ice cave on the far left. That opening is recreated by the freezing icicles every year. 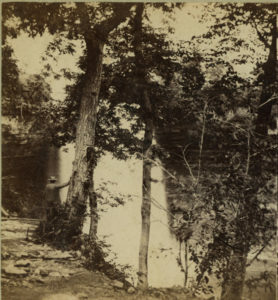 French & Sawyer, photographers from Keene, New Hampshire, published this image of the falls taken probably in the late 1860s. 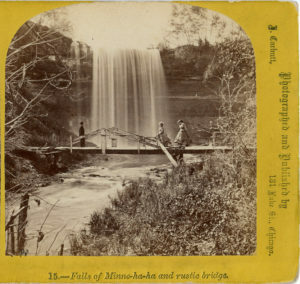 It was a relatively simple matter for John Carbutt to come to Minnehaha in the 1864-1866 period. He was in Chicago, and by 1865 there were trains between the Twin Cities and Chicago. It took five days to travel to Minnesota from New York in the early 1870s. Probably it took another day to get from New Hampshire to New York. 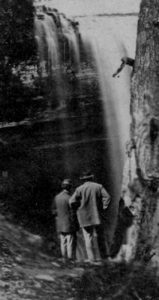 And perhaps French & Sawyer came out from Keene NH to the Great Northwest to photograph places like Minnehaha Falls. This photo is from the late 1860s (at a guess). 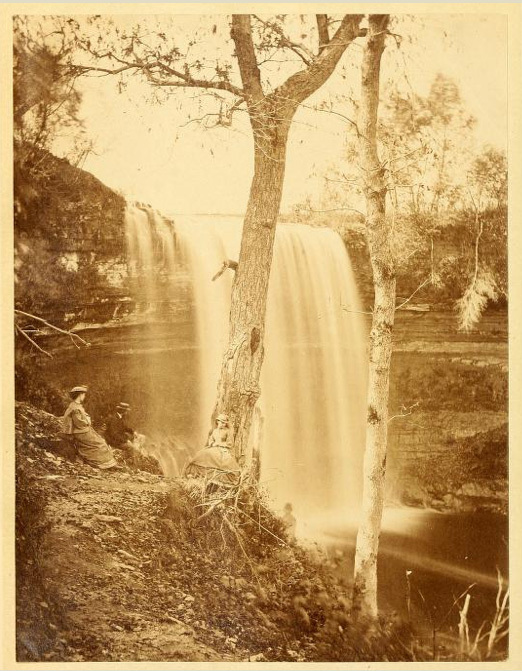 Minnehaha was world-famous then, and fame was an inducement for photographers to visit here. Mollie Carbutt standing between Edward L. Wilson, left, and Mrs. Wilson. Note that the bridge is not in good repair. Chicago’s John Carbutt took this picture of his wife and Mr. and Mrs. Edward L. Wilson in October 1866, and it’s interesting for several reasons. That very first bridge across the creek is in terrible condition with obvious broken railings. It’s now a few years old. 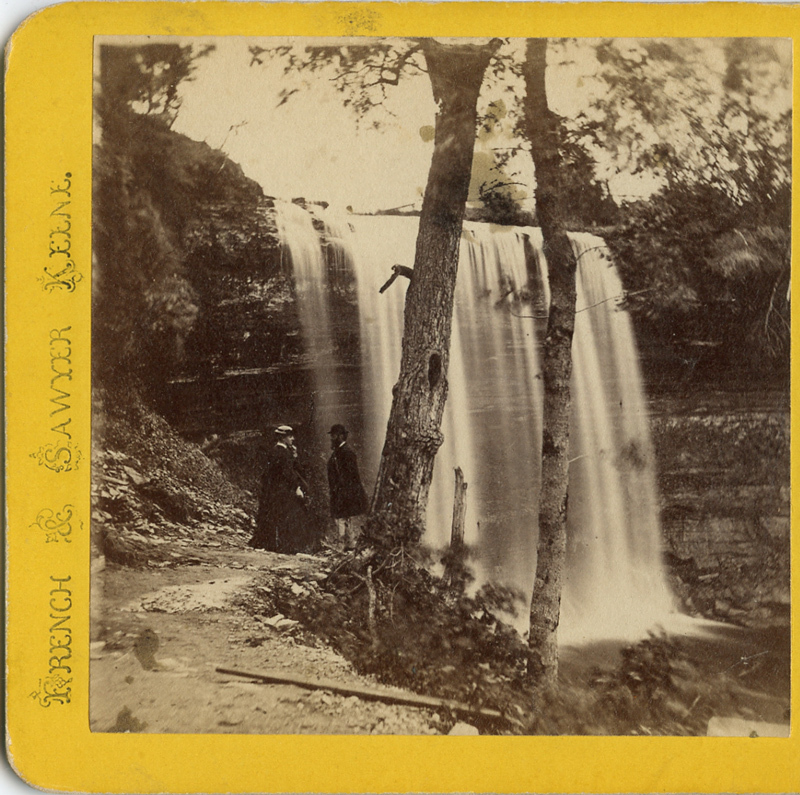 Dating pictures of Minnehaha Falls is an imprecise art. The images themselves, as well as the physical objects–the photographs–offer little clues. Mostly, no one wrote the dates on these pictures, so assigning a date means putting together these little clues, and doing research, and then making best-guesses. 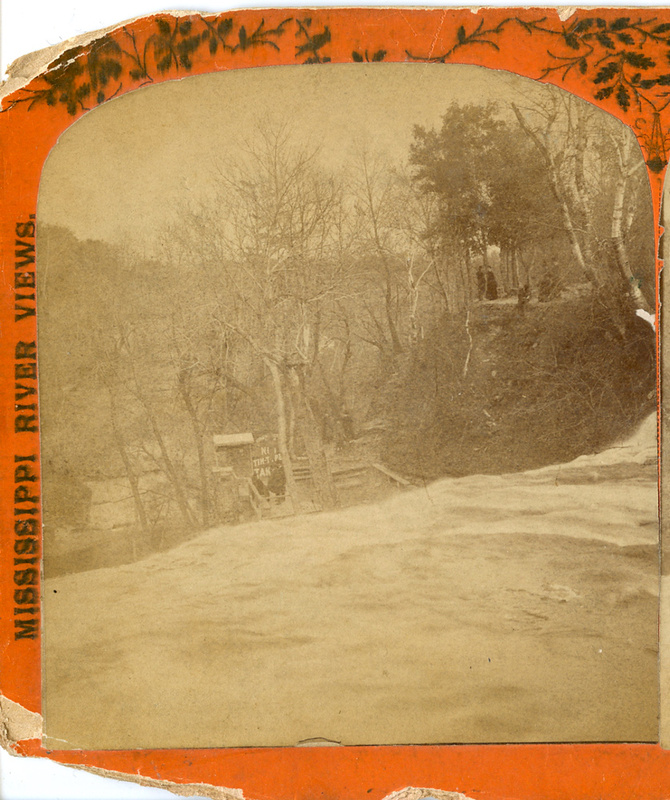 Taken no later than 1864, but mostly likely taken in the late 1850s. It’s a fine view of the falls, but the waterfall is slightly hidden behind those tree branches. And for every subsequent picture taken from this viewpoint, the branches have been cut away, as you can see. 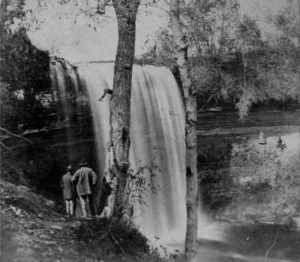 John Carbutt and Edward L. Wilson gazing at their wives across the Minnehaha gorge in 1866. John Carbutt, based in Chicago, was among the most innovative of 19th century photographers. He was the first to print on celluloid, opening the door to the entire film industry. And he perfected the printing of X-ray photographs on glass plates. Carbutt also took commissions for series of images on the frontier. He was most celebrated for his images taken along the Union Pacific Railroad as it rushed west across Nebraska towards the 100th Meridian and the completion of the trans-continental railroad. But Carbutt also took a few series of pictures in Minnesota, including some for the Northwestern Packet Company. Half a stereo view from the late 1870s. You’re looking east, over the lip of the Falls. 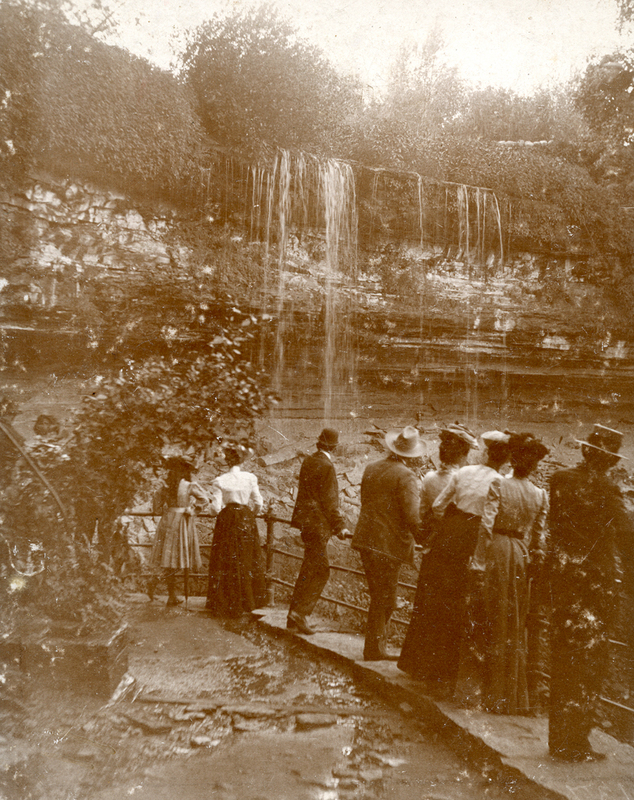 Before the Minneapolis Board of Park Commissioners came to own Minnehaha Falls in 1889, it was privately held by Franklin Steele, George W. Lincoln, and a few others. These landowners rented out their land to people running saloons, restaurants, and hotels, and to photographers.